December is the time for giving both holiday gifts and donations to good causes. With that in mind, would you like to trade gifts with Long Now? 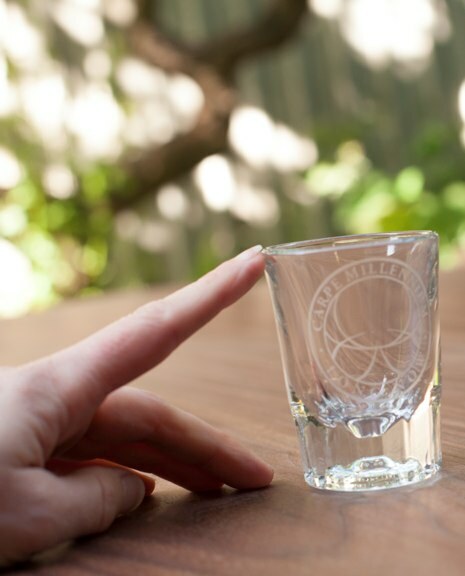 If you donate $100 or more to the Long Now Salon we will add a special Long Now shot glass to gifts you receive. This offer is only good for new gifts of $100 or more received in December of 02013 while our supplies of shot glasses last. Of course you get the standard donation benefits as well. 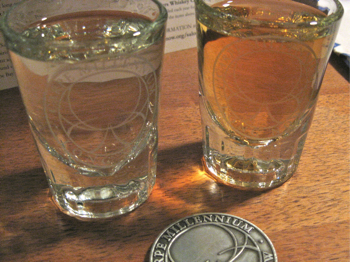 So for $100 you receive both a glass and a Long Now Challenge Coin (all donation levels are shown here). Let us know if you are giving for a second time and we’ll make sure you receive the benefits for your cumulative gift amount. This glass has only previously been available at small on-site events at Long Now’s San Francisco headquarters. It holds 2 fluid ounces, features our Carpe Millennium logo, and makes a great gift (though we’ll understand if you want to keep it for yourself). Tis the season of shipping delays, so donate early for the best chance to receive it by Christmas. The Long Now Salon will be a gathering space for our members and the public that incorporates Long Now artifacts, a two-story crowd-curated library, and a state-of-the-art A/V system which will play ambient sound curated by Brian Eno. Serving inspired cocktails as well as artisan coffee and tea, the Salon will also feature a Brian Eno light painting and other unique features. Open 7-days a week for the general public and home to a wide variety of smaller Long Now events, The Long Now Salon is another step in fulfilling our mission to make long-term thinking more instinctive and common, rather than difficult and rare. The Salon renovation is progressing on schedule. No opening date has been announced yet, but it will be in the first half of 02014. Thanks again to everyone who has donated so far.